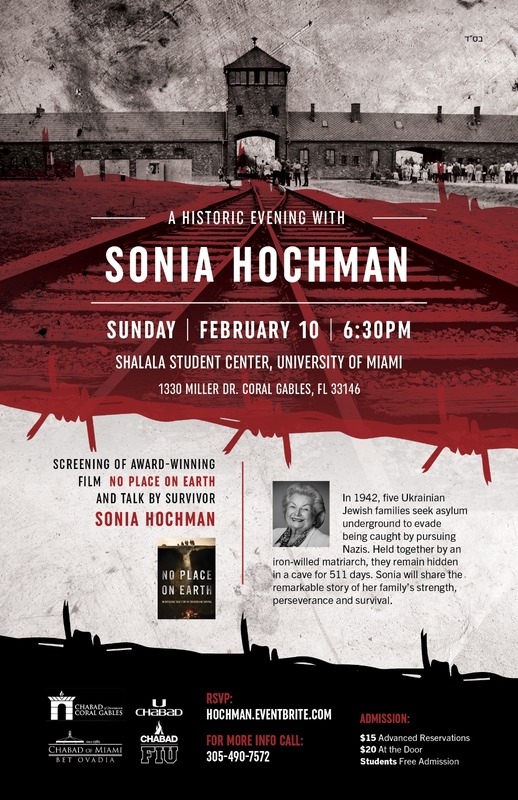 The entire community is invited to ‘An Evening with Sonia Hochman’ on Sunday, February 10, 6:30 pm at the University of Miami campus in Coral Gables. Sonia will share the remarkable story of her family’s strength, perseverance and survival in an underground cave to evade being caught by pursuing Nazis. One of those who took refuge in the cave during the war will be at the University of Miami campus, Sunday, February 10. Sonia Hochman will share her experience of survival as a child. Hochman will give an introduction to the film, which tells of the five Ukrainian Jewish families, led by matriarch Esther Stermer, who created their own society to escape the Holocaust. While the men collected food and supplies and chopped firewood at night, the women and girls remained in the cave, surviving 511 days underground — longer than anyone in recorded history. Sixty-seven years later, Nicola led four of the survivors back to “thank” the cave. The program will take place on Sunday, February 10th, 6:30 pm, at the Shalala Student Center, 1330 Miller Dr, Coral Gables, FL 33146. Film screening of ‘No Place on Earth’ will be preceded by an introduction by Sonia Hochman and followed by Q&A. The event is open to the public. To RSVP, visit hochman.eventbrite.com. For more info call 305-490-7572.